The Thanksgiving meal is like a “Greatest Hits” album of your favorite family recipes. Whether it’s your aunt’s signature marshmallow-topped sweet potatoes, or your cousin’s signature sweet-and-sour pot roast, eating these delectable, love-cooked dishes, is what makes the holiday dinner so special. This is not the day to count the calories in that slice of pumpkin pie, or carefully measure a scoop of mashed potatoes. Thanksgiving can be your reward for all the discipline you’ve shown throughout the year. With that being said, there are a few dishes that should be eaten in moderation, or skipped altogether. 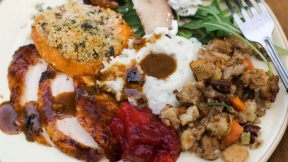 Nutritionists and doctors both agree that it’s best to never go to the Thanksgiving meal hungry. 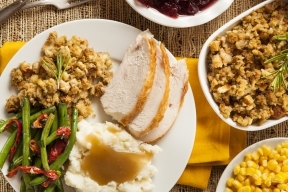 Here are a few foods that doctors wouldn’t eat at Thanksgiving dinner— and why. When we say “appetizers,” we’re not referring to bowls of mixed nuts or veggies and dip. We’re talking about those tantalizing mini-hot dogs, bacon-wrapped dates, and mini quiches that can be difficult to resist as anticipation for the holiday meal builds; there’s a good reason to resist, however. “Passed appetizers of any kind are often high-calorie, and it’s difficult to track of how many you’ve eaten,” says Dr. Will Harper, former Director of the Personalized Health and Prevention program at the University of Chicago. “Just two mini quiches and two bacon-wrapped dates can easily add up to more than 400 calories, which is 25 percent of the daily caloric intake for most people who are trying to lose weight,” he points out. “As a physician who works in the field of diabetes and diabetes prevention,” says Dr. Dana Kent, Medical Director of Health Promotion and Education at Natividad Medical Center in Salinas, California, “I stay away from some of the dishes of my youth, like creamed onions and green beans with creamed mushroom sauce.” In order to reduce the saturated fat and calorie content of what’s already an enormously high-calorie meal, Dr. Kent recommends substituting a light dish of fresh green beans sauté-steamed in a bit of olive oil with garlic and fresh lemon.